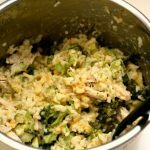 Instant Pot Cheesy Broccoli Rice–creamy risotto-like rice with cheddar, broccoli and (optional) pieces of chicken breast. A one pot family-friendly meal perfect for a busy weeknight. 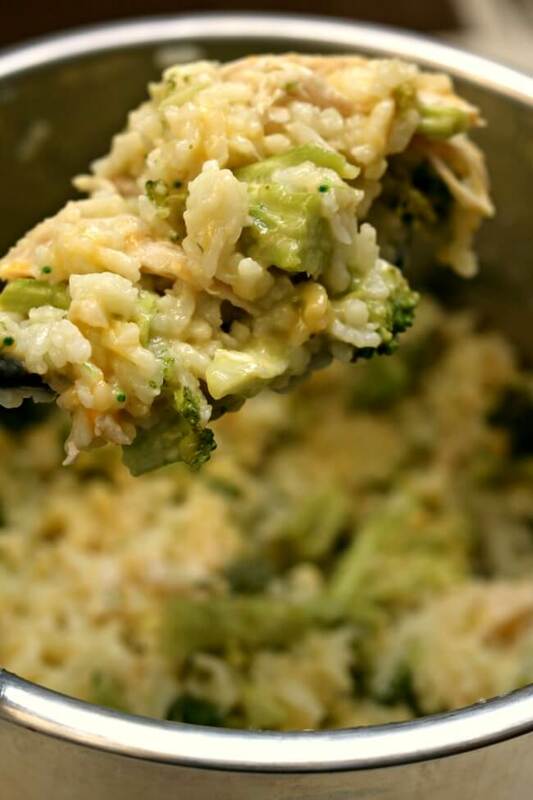 If you’re a fan of broccoli rice casserole you’re going to love this dish! 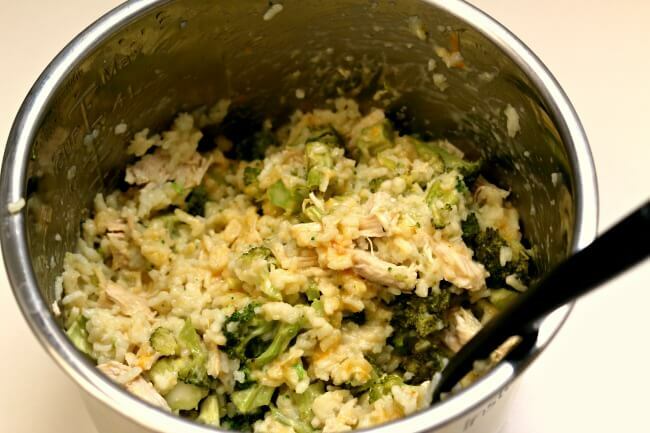 The creamy, risotto-like rice is a dream and the combination of broccoli and cheddar is a winner. I added in chicken to make it more of a meal and the chicken breast turned out tender and moist thanks to the chicken broth and the moist environment. 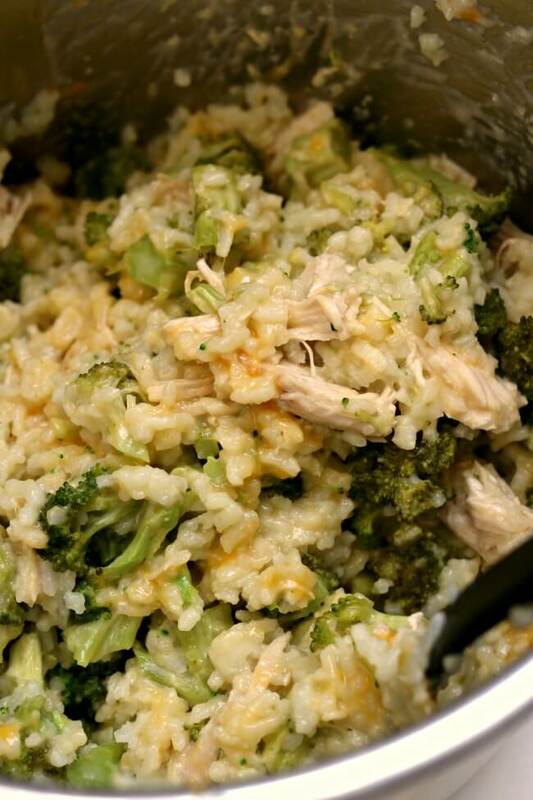 Arborio Rice: please buy this type of rice to make this dish. The reason we don’t have to use cream of soups or heavy cream to make it creamy is because of this type of rice. I found mine in the bulk section of Winco for about $2.00 a pound. Chicken: you can substitute boneless, skinless chicken thighs in the place of breasts, if you prefer. You could even use chicken drumsticks. Chicken broth: I use Better than Bouillon Chicken Base* in the place of chicken broth. I use 1 tsp of the base per cup of water. I love it! Cheddar: I buy mild cheddar in a block and grate it at home. I prefer this to the pre-grated cheddar because it melts more naturally and tastes better. To make Instant Pot Cheesy Broccoli Rice I used my 6 quart Instant Pot Duo 60 7 in 1*. I love this Instant Pot because it has the yogurt making function which I use almost weekly. It has two pressure settings (high and low), and there are also little slots in the handles so that you can rest the lid there instead of putting it down on your counter-top. 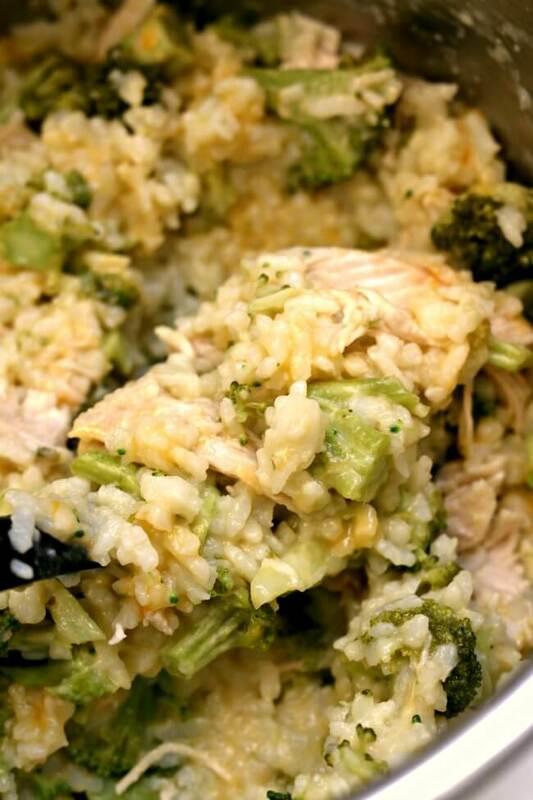 Creamy risotto-like rice with cheddar, broccoli and (optional) pieces of chicken breast. A one pot family-friendly meal perfect for a busy weeknight. Turn your Instant Pot to the saute setting. When the display says HOT add in the butter. Swirl the pot around to melt the butter. Once butter is melted add in the onion. Saute the onion for 3 minutes. Add in the garlic and rice and stir for 1 minute. Add in 1 cup of the broth and stir for 2 minutes. Add in the remaining broth, the salt and then lay the chicken on top (if using). Cover the pot and secure the lid. Make sure valve is set to sealing. Set the manual/pressure cook button to 10 minutes (high pressure). Once time is up let the pot sit there for 10 minutes and then move the valve to venting. Remove the lid. If using frozen broccoli florets, put them in a colander and run hot water over them for a couple minutes. Shake off the excess water and stir them into the rice. If using fresh broccoli florets you can do one of two things. First and faster idea is to put the florets in a glass bowl with a quarter cup of water and put them in the microwave for 4-5 minutes, until the broccoli is steamed and reaches your desired cooked consistency. Second idea is you add the fresh broccoli to the pot after the pressure has released and then put the lid back on and let the broccoli cook on the warm setting with the lid on for about 20 minutes. Remove the chicken and place on a cutting board. Cut into pieces. Then stir them back into the pot. Stir in the cheddar. Salt and pepper to taste. Scoop onto serving plates and enjoy. This recipe is gluten free. Just check your broth to be sure it does not contain gluten. Is it ok to use chicken thighs with bone in? Yeah I bet that would work. Just check the internal temp of the bone in thigh and make sure it’s at least 165. Is it ok to use chicken thighs with bone in!? I don’t think the jasmine rice will work with such a long cooking time. It will get mushy. Is that what happened? I added mushrooms and red bell pepper (I sauté them in another pan and transfer) as well as Italian seasoning and red pepper flakes. My husband says this is the best thing I’ve ever made! Awesome recipe! Thank you for sharing!! Wow great ideas. Thanks for sharing. Absolute fantastic recipe! I also made a modification the 2nd time I made it. I followed the recipe exactly the same except I substituted vegetable broth for chicken broth and substituted fresh chopped cremini mushrooms for broccoli. A great variation. I also left out the chicken for a meatless dish. Perfect meal for a gloomy day- served it with a green salad on the side. Added sliced mushrooms just because. And it’s DELICIOUS!!!! We all need meals like this for those gloomy days don’t we? When you let the pot sit for 10 after 10 minutes of manual/pressure in step 2, do you turn off the warming setting? I’ve made this dish numerous times now and I cannot believe how tasty it comes out every single time. My one and half year old loves it, and I love that it’s the one dish I’ve made with chicken breast that actually makes it juicy rather than dry. Thank you. This is so nice to hear. Do you have this recipe for a slow cooker? I can’t find arborio rice. What other kind of rice can I use and do I need to adjust the time? I haven’t tried it but Bob did and said, “I cooked one cup of long grain white rice with 1 1/2 cups of chicken broth and 3 chicken thighs on top of the rice, for 8 minutes on High. Perfect! There is no way you cook broccoli for 20 minutes. It takes 0 minutes. It would be mush. How do you do this? Please re-read the instructions. Put broccoli in the pot AFTER the pressure is released for 20 mins. It will cook just by being in the very hot pot. It actually says add broccoli and cook for 20 minutes. The broccoli is meant to just sit in the instant pot on Keep Warm or Off? And should the lid be closed or can it be open? I just fixed the recipe so it is clearer. The broccoli can cook on the warm setting with the lid on for 20 minutes. I”m not familiar with that kind of rice. What’s its benefit/difference over regular white rice. I accidentally bought Basmati rice instead of the rice you listed…is this kind ok to use?? I made this today and after it was done I sprinkled a cracker and butter mixture over it and used my glasss lid so the mixture wouldn’t get mushy. It was delish!!! Can you double this recipe? I’m new to the instant pot and don’t know all the ins and outs. Thanks! If you don’t use chicken, can you add the broccoli in the beginning with the rice and pressure cook? How long? no the broccoli will be completely mushy. Unfortunately you’ll have to add it in after the rice is cooked. The rice flavor was nice. Used Jasmine rice and it came out too mushy though. Will have to do the long grain or brown in the future. Can not believe how fast the instant pot cooks stuff. Just geeting used to my new applicance. Wow. Yeah it takes a little to get used to it and how quickly things cook! When you put the broccoli in at the end, do you have to let it build to pressure again and then do the 20 minutes or can it sit in there on keep warm for 20 minutes? You don’t do another pressure build. You just let it cook on the keep warm setting. We loved it!! I used up some left over chicken and vegetables, it turned out great!! So great to hear this Lisa! If I were to use brown rice how much time would I need to add? Brown rice takes 22 minutes to cook. I tried to leave a comment. I dont think it took. I was asking if I doubled the rice how much longer would I need to cook it for? Thank you. Hi Rachel, just keep the cooking time the same! Make sure to double the liquid too. If I wanted to half the recipe do you think anything would have to change? nope! Should be fine to halve. I’m a newish instant pot owner. I’d like to replace about 3/4 cup of chicken broth with white wine or vermouth because I’m a little low on broth. Do you think there would be any issues with using alcohol in the IP? I don’t think so! Try it out! Sounds great, but I’m making this for my relatives who like white long grain rice. If I make it with long grain rice what subs should I make on time and chicken broth? Will you be making the chicken breasts with it? If so it’s not going to work I don’t think. The chicken needs 10 minutes of cooking time and the rice needs 3 minutes. If you’re not making the chicken with it you could try the long grain rice. I have never tried that yet so I’m not sure how it will turn out. I would keep the ratios the same…maybe slightly less chicken broth. I cooked one cup of long grain white rice with 1 1/2 cups of chicken bullion and 3 chicken thighs on top of the rice, for 8 minutes on High. Perfect! Will the chicken come out shredded looking or do I need to chunk the chicken omit that’s the style I want? And also one I add my frozen broccoli how much longer does it cook? oops sorry I just fixed the recipe to clarify the chicken part. Just cut it or shred it after it has cooked. If you add the frozen broccoli totally frozen then it will take a few minutes–like 10. If you run hot water over it to warm it it won’t take very long at all, 2-3 minutes. Cheese and broccoly is a really weird combo, but I love it anyways. Delicious recipe! I was thinking of using a can of black beans as a protein source instead of chicken to make it more of a full meal but still vegetarian (I’d also use vegetable broth instead of chicken). Do you think I should change any of the cooking instructions with using beans instead of chicken? No keep instructions the same. And just drain and rinse the beans before adding it in. Should be yummy! I ended up swapping the chicken and broccoli for cans of black beans and corn (just drained and rinsed both and tossed them in before cooking). Same recipe otherwise and it came out fantastic. I might cut the cook time to 8 minutes next time to give the rice a bit more bite to it but otherwise it was pretty much perfect and a new veggie option for my non-meat days. I made this recipe on Monday night. Very tasty! I thought it would be a bit bland and was pleasantly surprised to find that it’s not bland at all. I used boneless, skinless chicken thighs instead of breasts and a wee bit more broccoli than the recipe called for. Was delicious. Oh I’m totally a fan of thighs I bet that was amazing! Can you use frozen chicken breasts in this recipe? Would that change the IP time? Thank you! I actually made it with frozen and it was fine with the same cooking time!